In 1955, the car was the sensation: A technology and design icon was born! 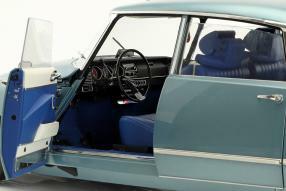 The vehicles of the model series Citroën DS have celebrated its world premier on the Paris car salon in October and polarized as well with its aerodynamically favorable design as with its fancy technique. 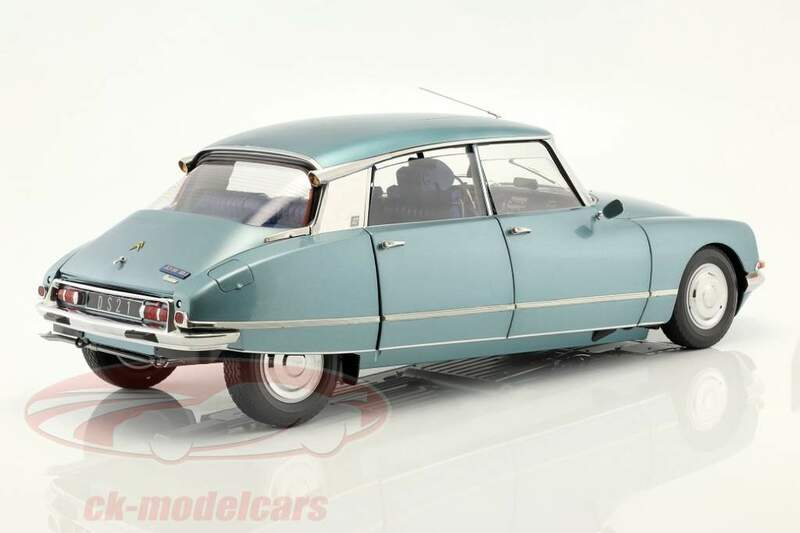 So the DS showed its central hydraulic system for the suspension, the breaks, the transmission and power steering, which was used here for the first time in the mass production. In the period from October 4th 1955 to April 24th 1975, the production period of the DS, a total of 1.456.115 cars as sedan, estate car, break, coupe and convertible had been built. Premium X has produced a modelcar to this automobile legend that just astonishes us, so big and magnificent details. We want to present it brifly to you. The miniature with the item number PR8-003A comes out of diecast and in the color light blue metallic to the collectors. 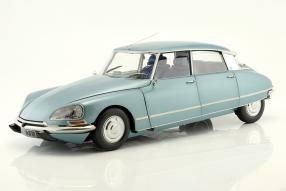 It matches the Citroën DS 21 of the model year 1970 in scale 1:8. Novelties to this large size - once came to popularity through the kits of Ferrari from Pocher - are rare in the model building area. Premium X has produced a model, in which nothing is lacking: An opening bonnet, doors and trunk are also on board, as well as a true-to-original interior trim, a detailed engine compartment and steerable front wheels. 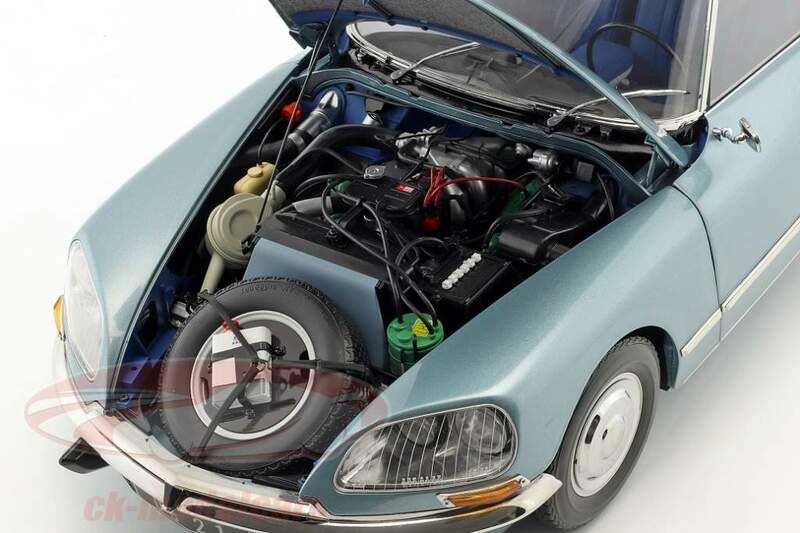 But of course that sounds like a description that could fit any model of Norev or Autoart: The special feature of the DS 21 in 1:8 is the execution of all its details. The model is just over 60 centimeters long; a variant in 1:18 would just come on its 27. It becomes clear that the creators have much more possibilities to replicate parts than it would be possible in the so-called Bburago size. That the appearance of the lines of the DS 21 fits, is clear at first glance. If the collector opens the bonnet, every day life becomes a holiday: engine vision, ancillaries, ignition cable and ignition coil, the lines of the hydraulics, brake cylinders and brake hoses, the oil cover, the battery, the windscreen washer - that is all mega! 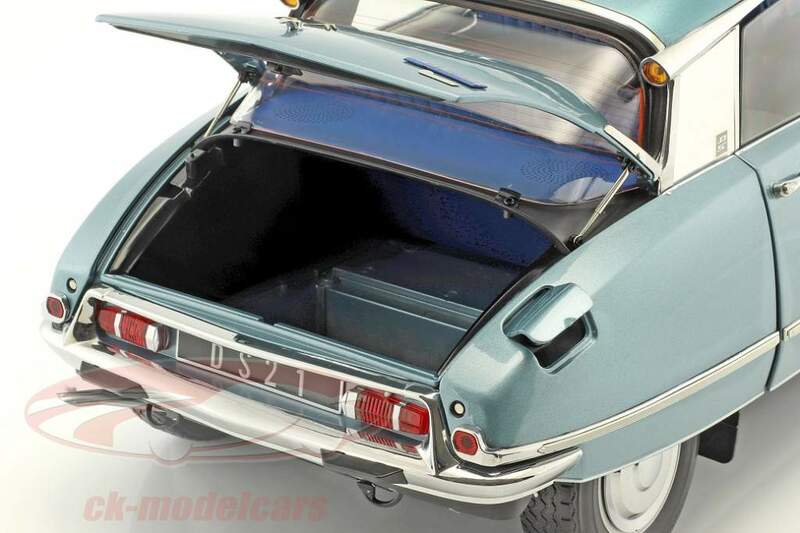 The way of opening the hood of the model car, the fidelity of the bulkhead, top notch! The fact that the fans can also read markings and manufacturer information of the headlight lenses is really rare in the model making area. The screws on the turn signal lenses or the pulls for opening the bonnet. Just the role model can do it better. Why doesn't start the powertrain? It would be trustworthy to the model that it can do this. The 21 in the designation DS 21 gives approximately the capacity, which is under the hood, so about 2.1 liters. In the DS 21 without the "ie" for injection, the four-cylinder provided 76 kW / 104 hp; the engine was built from 1968 to 1972. Of course, its miniature version in this model is the highlight, but also the execution of the interior with its controls and detailed structured seats and side panels is a feast for the eyes, where we can not get enough of it. What also applies to the opening gas cap. Very well executed was also the hood opening of the trunk. Even the speakers ... oh, what else do we say? Just look at the pictures and enjoy discovering the fabulous details!